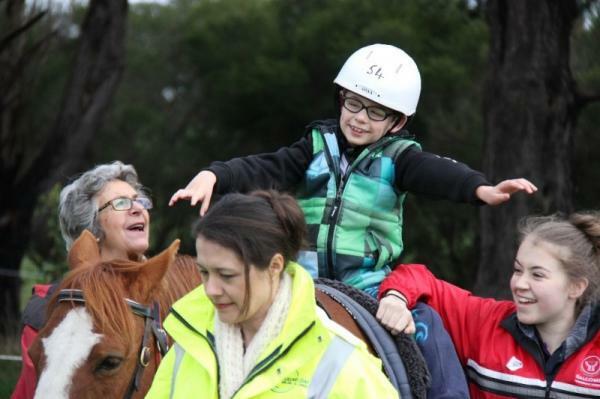 RDA Peninsula is a non-profit organisation developing ability and enriching lives through specialised programs and relationships with horses. This relationship is a very special one, which has been known about for thousands of years, but has only recently been researched and documented. RDA Peninsula services the Frankston and Mornington Peninsula regions of Victoria. After over 30 years at our original site, due to the land sale, we had to find a new base and were fortunate enough to be offered a site outside Mount Martha. Riding commenced at the wonderful new venue Amandiri, earlier this year. A new place to call home. However, the new site is what many would call a “blank canvas”. Over the last 6 months fences have been erected, shelters built, an office and tack room erected, porta loos rented and a concrete slab poured, to give hard standing for the horses between lessons. Starting from scratch has been hugely draining on both our finances and resources. Without our volunteers and donators, we simply could not continue. The list of what we need is long and varied, from toilets suitable for wheelchair access to an indoor arena (the lottery dream) and much, much, much more in between. Being a volunteer organisation with no government backing, we rely on the generosity of the community and organisations to help us meet our running costs and the purchase of new equipment. We also have the cost of feeding the horses and maintaining them with dentists, farriers, vets and tack. We have over fifty riders and seventy volunteers who come each week, to help with the RDA program with our ten beautiful horses of all sizes. Our riders come from three different special schools, one adult centre and some individual riders on Saturday mornings. Our volunteers from school age to retirement! We are so very proud of our work and the difference we make to these people’s lives. However our aim of this wonderful campaign is to erect a permanent roof structure over the day yards, so that our horses can not only be protected from the rain, but also shaded on the hot days summer brings with it. In 2014, we experienced rainfall of nearly 40mm in 24hrs to temperatures soaring to over 45 degrees centigrade. Every time rain and heat stop play, for welfare and safety reasons, valuable lessons are cancelled. With the building of a roof over the day yard (pictured above in the rain!) we can stop cancelling lessons and help to provide better continuity for both our riders and our horses. To mark our first 500 LIKES on Facebook, we have decided to launch the Give me FIVE campaign!! A campaign to get as many people to donate just $5 to reach our target of $5000!!! Obviously you can donate more, but $5 sounded like a nice figure to match our 500 LIKES. $500 sounds equally lovely though! The super exciting news is we have had a private donator offer give us $3000 to complete the $8000 build if we reach our $5000 target!! So please, share with your friends and family. As we are an endorsed as a deucable gift certificate charity (DGR), All donations over $2.00 are tax deductable. If you would like a receipt, please indicate so in the comments and one will be enet immediately to your email. Please visit our facebook page, where you can see for yourself what we do, our horses and the extensive work that has been done by our super volunteers to 30 acres of grass.